The railway route between Rose Grove, on the line from Preston to Colne, and Todmorden was seen as an offshoot of the Manchester & Leeds (Calder Valley) railway – indeed for many decades Ordnance Survey maps continued to describe it as ‘Burnley Branch’. 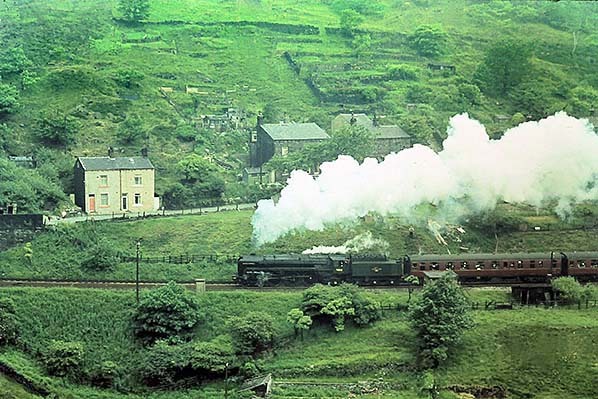 However it is generally known among railway enthusiasts as the ‘Copy Pit route’, a name derived not from a station or town but from the small colliery, signal box and line summit about midway between Rose Grove and Todmorden. In the mid 1960s ‘Jubilee’ No.45694 'Bellerophon' is arriving at Stansfield Hall where a banking engine will join at the rear before attempting the climb to the summit on the Copy Pit line. A Hughes ‘Crab’, the banking engine, can be seen in the background. The 1X40 headcode denotes a Heckmondwyke to Morecambe excursion. ‘Bellerophon’ was built at the LMS Crewe works in March 1936. She would be withdrawn on 31 December 1966 from 25A, Wakefield shed, and cut up in June 1967 by Drapers, Neptune Street Goods Yard, Hull. .On 17 April 1999 Past Time Rail’s excursion ‘The Cotton Weaver’ from Euston traversed the Guide Bridge – Stalybridge line, celebrated for its minimal ‘Parliamentary’ passenger train service, and the Copy Pit route. 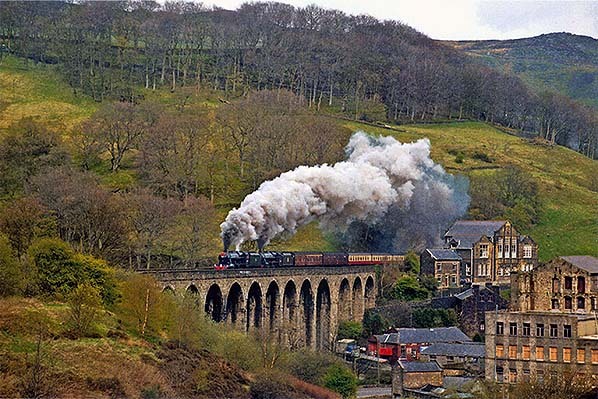 It is seen here crossing the viaduct at Lydgate between Stansfield Hall and Cornholme on the rising 1 in 65 gradient. 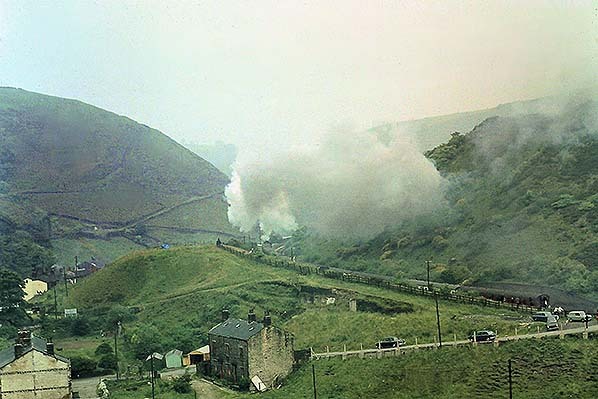 Eddie Bobrowski, whose colour photos of special steam workings are highly regarded, has captured the spectacular setting and the hard-working locomotives with consummate skill. The train is headed by Stanier locos 8F No. 48773 and ‘Black Five’ No.45407. The North British Railway Company works in Glasgow built 48773 in 1940 for the War Department, and it is preserved by the Stanier 8F Locomotive Society and normally based on the Severn Valley Railway. Its companion was built in September 1937 by Armstrong Whitworth in Newcastle and is resident on the East Lancashire Railway. The Copy Pit route was built after the Manchester & Leeds Railway (M&L) and the East Lancashire Railway to which its ends were connected. A railway between Manchester and Leeds was first mooted, unsuccessfully, in 1825, and a further proposal in 1830 also foundered, partly owing to opposition by canal interests – specifically the Aire & Calder Navigation and the Calder & Hebble Co. Finally, in 1836 a prospectus was issued for the Manchester & Leeds Railway ‘to form a central portion of a great main line running east and west between Liverpool and Hull’, to be surveyed by George Stephenson and Thomas L Gooch. Despite continued opposition from the canal companies, landowners whose property would be violated and some Leeds merchants, the project received the Royal Assent on 5 May 1837, albeit with minor variations to the proposed route. The railway, which stretched from Manchester to Normanton and onward to Leeds via North Midland metals, was dubbed the ‘Eleven Towns Railway’. The line passed through the Pennines and required numerous viaducts and tunnels. The watershed was crossed by means of the Summit Tunnel (1 mile 1,125yd) between Littleborough and Todmorden, enabling the line to rise no higher than 537ft – much lower than the altitudes reached by the neighbouring Copy Pit and Rochdale-Bacup routes. Construction of this substantial tunnel delayed the opening of the line, but there were also problems encountered between Todmorden and Sowerby Bridge. One was the greed of landowners - Samuel Turner at Sowerby Bridge, and Thomas Fielden of Todmorden, a textile manufacturer and, ironically, a director of the Manchester & Leeds Railway; another was the 250yd Charlestown Tunnel, where the geology proved obstinate and the tunnel was abandoned in favour of a diversion via a 30ch-radius curve (imposing a speed restriction on the line). The section from Manchester (Oldham Road) to Littleborough opened to the public on 4 July 1839, followed by Hebden Bridge to Normanton on 5 October 1840. From Hebden Bridge the line was opened to the north end of Summit Tunnel on 1 January 1841, and the line opened throughout on 1 March 1841. Initially trains terminated in Manchester at Oldham Road station, but from 1 January 1844 Manchester Victoria was brought into use. The rough terrain which imposed tunnels and viaducts on the central part of the route also threw up challenges with placing and designing the stations. Biddle in Victorian Stations (1973) makes special mention of the series of fascinating stations, including Eastwood, which had to be accommodated on a particularly unpromising and precipitous site; thankfully, some good photographs or engravings of these stations, both open and closed, are available. At its western end the Copy Pit route sprang from the East Lancashire Railway (ELR) line from Preston to Colne. This line opened in stages: from Farington on the West Coast main line to Blackburn on 1 June 1846; Blackburn to Accrington on 19 June 1848; then onward to Burnley Barracks (18 September 1848) and to Colne (1 February 1849). At Colne the ELR made end-on connection with the Leeds & Bradford Extension Railway (leased to the Midland Railway) which had been opened from Skipton on 2 October 1848. .On 20 August 1966 No.45565 ‘Victoria’ heads a westbound train approaching Copy Pit summit. The track nearest the camera is the Up Loop from Copy Pit to Portsmouth (Lancs). The engine is a Stanier-designed ‘Jubilee’ class 4-6-0, built at the North British Locomotive Company works, Glasgow, in August 1934. She would be withdrawn from 25F, Low Moor shed, on 6 January 1967 and cut up five months later by Drapers, Neptune Street Goods Yard, Hull. The origin of the Copy Pit route can be traced back to 1844 when the Manchester & Leeds Railway projected the line from Todmorden to Rose Grove. Royal Assent was granted on 30 June 1845 to construct the branch from their route that opened between the two cities in 1839-41.The route was surveyed by T L Gooch. At first the line was intended to be single track, and a contract of £140,000 on this basis was awarded to Faviell on 20 October 1845. The decision was taken in 1846 to build a double-track line, and Faviell agreed to do this for an additional £66,000. In the mid nineteenth century the Cliviger gorge was so remote that it was said that some of the purchase deeds of the railway had to be made out to illiterate farmers in favour of their nicknames, such as ‘Jack o’Tops’, although the road from Todmorden to Burnley had been turnpiked since about 1759. Construction began during the short ‘Railway Mania’, but ceased on 16 October 1847 when the newly created Lancashire & Yorkshire Railway (successor to the M&L) ran into financial difficulties. Work resumed, but the company had decided to reduce it to a single line while providing space for a second track. The contractor was making unsatisfactory progress, and the LYR dismissed him and took over the work directly. A single track from Todmorden to Burnley (Manchester Road, or Thorneybank) was ready for a successful inspection on 27 October 1849 and a special train for company directors three days later. The line officially opened on 12 November 1849 with intermediate stations almost certainly provided from the outset at Towneley, Holme and Portsmouth. The earliest timetables do not include these three stations, but there are numerous examples of such apparent negligence as the protocols of how to present timetable information gradually took shape. 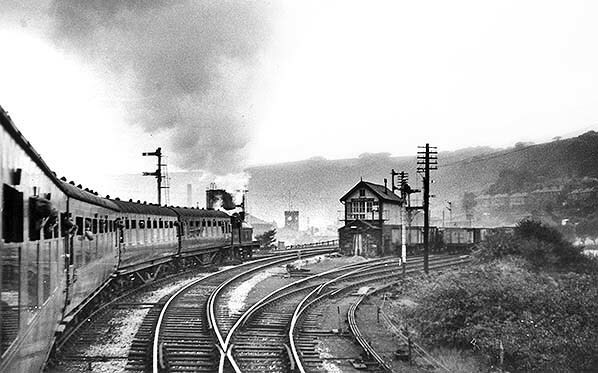 On 17 July 1965 a BRCW (later Class 110) 6-car ‘Calder Valley’ DMU has left Todmorden and is heading towards Hebden Bridge. This is the 10.30am service from Liverpool Exchange to Harrogate; trains ran between Liverpool and Harrogate from June 1962 until September 1967, requiring reversal at Bradford Exchange and Leeds Central (Leeds City from May 1967). In the background the banker engine can be seen (Stanier 8F). The most impressive engineering feature of the route is the 13-arch viaduct at Lydgate, between Stansfield Hall and Cornholme stations – both of which opened some time after the line; the viaduct is, confusingly, known by various names including Knott Wood (alternative spellings are Nott Wood and Knot Wood), Kitson Wood (the name of the adjacent tunnel) and Lydgate. There are three short tunnels: Kitson Wood (290yd); Holme (265yd) a short distance south-east of Holme station; and Towneley (398yd) about a mile south-east of Towneley station. Holme Tunnel has required substantial repairs in recent times, as noted below. The short section from Manchester Road to Gannow Junction (Rose Grove) where it met the East Lancashire Railway was constructed by John Torkington at a tender of £10,000 and opened in August or September 1850: Marshall gives the first date and Holt the second. The doubling of the route was soon under consideration. On 22 December 1852 the LYR estimated the cost at £19,745 14s, but it took until 13 August 1859 for the LYR/ELR Amalgamation Act to bring about the line-doubling; it was stipulated that this work had to be completed within 18 months. The delay caused the estimate for the work to rise to £22,000. A timber viaduct between Towneley and Burnley was replaced by retaining walls and filling in time for the double-track route to open on 1 July 1860. In 1866 the original station at Burnley (Manchester Road / Thorneybank) closed and was replaced by a new Manchester Road station on the opposite side of the road bridge, whilst the goods facilities were retained at the original site. The exact date of opening of the new Manchester Road station is not known: an announcement was made on 16 October 1866 that the new station would be opened on 1 November ‘if ready’. 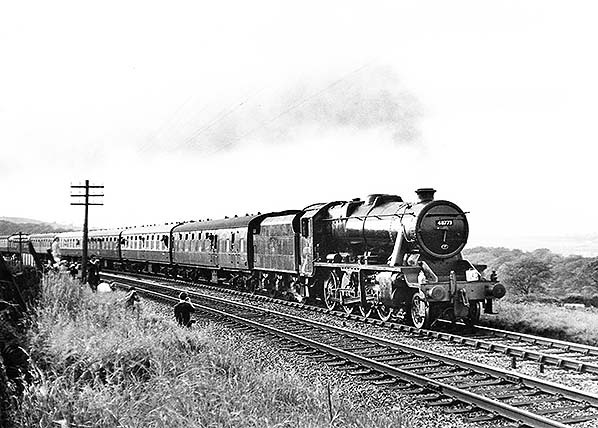 The RCTS ‘Dalesman No.2’ railtour is seen travelling west near Cornholme on 16 June 1968, hauled by ‘Britannia’ class No.70013 ‘Oliver Cromwell’. To enable trains to travel directly between East Lancashire and Yorkshire a spur was constructed from Hall Royd Junction on the Manchester and Leeds line to Stansfield Hall Junction on the Burnley Branch. This was carried out without parliamentary powers and was approved by the Board of Trade on 5 March 1862. Because trains using this spur no longer served Todmorden, Stansfield Hall station was opened in December 1868. Another new station opened on the route in July 1878 at Cornholme, about a mile east of Portsmouth. At the time of opening of the Copy Pit route, the Lancashire/West Riding of Yorkshire border passed through the centre of Todmorden, so all of the ‘branch’ stations were in Lancashire. However, in 1888 the boundary was adjusted to place Todmorden and its urban tentacles entirely within Yorkshire. The new boundary was (and still is) less than a mile west of Portsmouth; nevertheless Portsmouth station continued to be known in timetables as Portsmouth (Lancs) until it closed, although it has been seen as Portsmouth (Yorks) on a ticket. There is lively debate about the true county affiliation of Todmorden, and the matter is confused by the town having been considered Lancashire by the postal authorities (until they recently decided that county names on addresses are unnecessary) and having an Oldham postcode – though Oldham (Lancs) became Oldham (Greater Manchester) in 1974. A spectacular accident occurred on the Copy Pit route in September 1907 involving a Normanton to Liverpool goods train which became derailed at Holme station, killing the deputy stationmaster and demolishing the buildings on the down platform. More details, and photographs of the aftermath, can be found on the Holme (Lancs) station page. 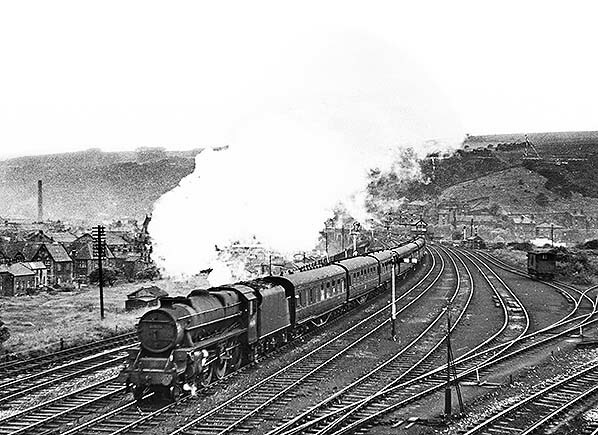 A Blackpool excursion train is taking the Copy Pit line at Hall Royd Junction on 30 March 1964. Hauling the train is Stanier-designed ‘Jubilee’ class 4-6-0 No.45694 ‘Bellerophon’. The loco was built at the LMS Crewe works in March 1936. She would be withdrawn on 31 December 1966 from 25A, Wakefield shed, and cut up in June 1967 by Drapers, Neptune Street Goods Yard, Hull. 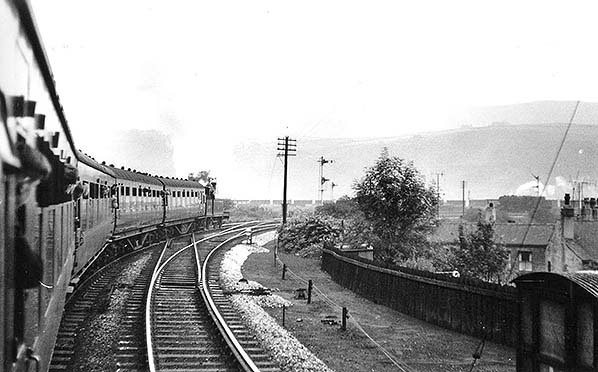 The London & North Western Railway’s (LNWR) rival ‘Standedge’ route between Manchester and Leeds, via Huddersfield was to prove to be more important than the LYR Calder Valley route; in 1922 the LNWR absorbed the LYR, and in 1923 the LNWR became part of the London, Midland & Scottish Railway at the ‘Grouping’. The Standedge line was more direct than the Calder Valley route, and its capacity was increased by quadrupling a large section. This route also had to contend with the Pennine landscape, yet the Standedge Tunnels (just over 3 miles in length) were able to take four tracks, and where the terrain and buildings prevented two more tracks being added between Stalybridge and Diggle an entirely new route (the Micklehurst Loop) of 6¾ miles was constructed by the LNWR to allow more traffic to be handled. Further north the Morley Tunnel (1 mile 1,609yd) remained double track. In the Reshaping of British Railways (‘Beeching Report’) of March 1963 both routes were to be retained for passenger traffic, but the Standedge route was effectively designated an ‘Inter-City’ line (a term not then in use) with most of its stations earmarked for closure. The Calder Valley route had already seen a number of its stations close (such as Smithy Bridge, Walsden, Eastwood and Luddendenfoot) and it was presumably considered a secondary route with important local traffic, justifying the retention of most of its stations. By-and-large, Beeching’s intentions for these two lines were realised by 1970. The Copy Pit route never achieved great importance, although it carried some regional passenger services, notably summer trains (timetabled, plus relief and excursions) between the West Riding and Blackpool, and some through carriages to and from Kings Cross. Goods and mineral traffic between the industrial areas of the West Riding and Lancashire used the route. 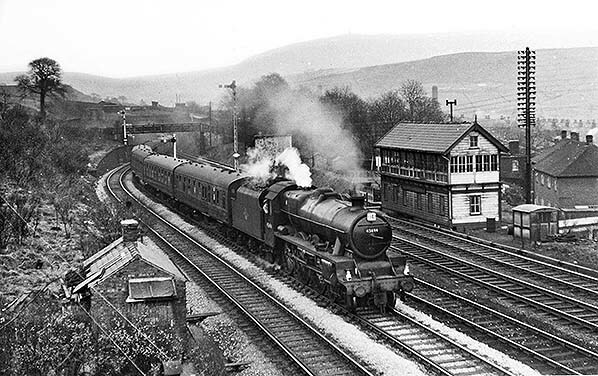 Local passenger traffic was limited, and station closures began in LMS days in 1930 with Holme, followed by Cornholme in 1938 and Stansfield Hall in 1944. Under British Railways (LMR) Towneley closed to passengers in 1952 and Portsmouth in 1958, and the final surviving station, Burnley (Manchester Road) succumbed in 1961. 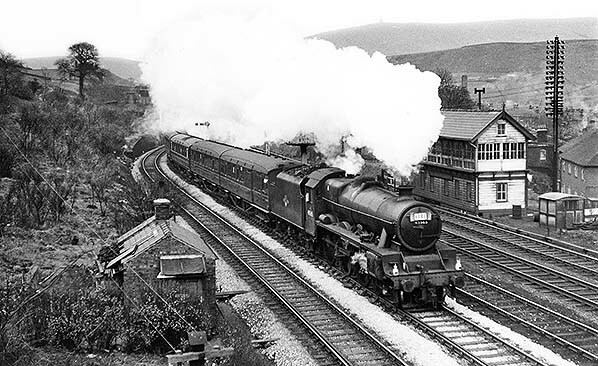 A few passenger trains continued to use the line, but the ‘Beeching Report’ listed Rose Grove to Todmorden for closure. Formal publication of the intended closure took place on 21 August 1964. The timetable, below, for the Copy Pit line from 14 June 1965 showed eight weekday trains in each direction, with an extra late train on Saturday, while on Sunday there were four trains each way. On 28 July 1965 the Minister of Transport, Thomas Fraser, gave his consent to closure. The passenger service was withdrawn on 1 November 1965. In the mid 1960s a westbound excursion train is headed by No.45694 ‘Bellerophon’ and is about to enter the 290yd Kitson Wood Tunnel. The loco was built at the LMS Crewe works in March 1936. She would be withdrawn on 31 December 1966 from 25A, Wakefield shed, and cut up in June 1967 by Drapers, Neptune Street Goods Yard, Hull. Curiously, the March 1967 BR Network for Development map, far from indicating that the Copy Pit route had closed, identified it as part of the passenger network to be retained! This document also indicated that the Skipton-Colne ‘trans-Pennine’ link would stay open (it closed) while the Leeds-Skipton line and branch to Bradford Forster Square would close to passengers (it remains open). Although ‘local’ services ceased in 1965, the long-standing Leeds to Blackpool morning train continued to run, but in summer only after 1976, and occasional excursions used the line, such as a Stevenage- Blackpool North ‘Illuminations Special’ on which the author travelled on Saturday 8 October 1977. 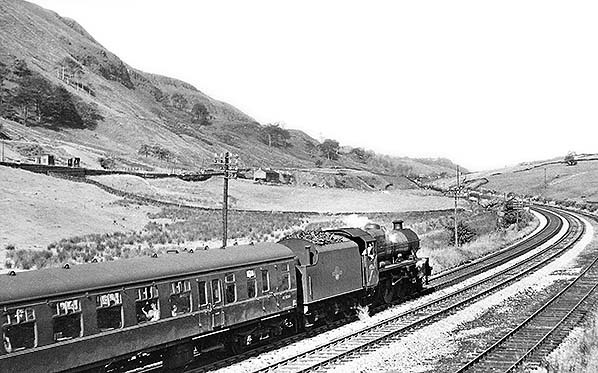 The Stansfield Hall-Todmorden curve, which ceased to carry any traffic, was officially closed in March 1973, and subsequently dismantled. The Copy Pit route was re-signalled and brought under the control of Preston power box in October 1973. During the 1970s the volume of freight traffic via Copy Pit dwindled so that by the early 1980s the only booked working was the daily Immingham to Preston oil train. British Rail’s ‘Corporate Plan’ of 1983 indicated that the line would soon close entirely. Thanks to an unexpected turn of events, regular passenger trains returned to the Copy Pit route in 1984. From 14 May the National & Provincial Building Society (formed by the amalgamation of the Provincial and Burnley building societies) chartered a daily weekday train to transfer staff and internal mail between its main offices at Bradford and Burnley, and from 1 October a regular advertised passenger service commenced on the ‘Roses Link’. On that day eight Lord Mayors, Mayors and prominent citizens from West Yorkshire and Lancashire, through which the service ran, assembled at midday at Hebden Bridge station to exchange red and white roses after the arrival of trains from Leeds and Preston. Initially there were six trains each way on weekdays between Leeds and Preston, some workings extending to Blackpool. Rose Grove station served Burnley until an unstaffed station was opened in October 1986 at Burnley Manchester Road on the site of the station that had closed a quarter of a century earlier. By summer 1987 some trains ran on this route on Sunday, initially not stopping at Burnley. The weekday service was subsequently increased to hourly, with more frequent Sunday trains, and from 1994 it became part of the ‘Trans-Pennine Express’ network. After much discussion, and a long time in planning, the ‘Todmorden Curve’ that had been abandoned in 1973 was re-laid as a single track and it opened to passenger services on 17 May 2015; a daily service operates hourly each way over these metals between Blackburn, Manchester Victoria and Wigan Wallgate (but only as far as Manchester on Sunday). A smart new building including a ticket office was provided on the up platform of Burnley Manchester Road station in time for the inauguration of the Todmorden service, and car parking spaces were increased from 12 to 50. 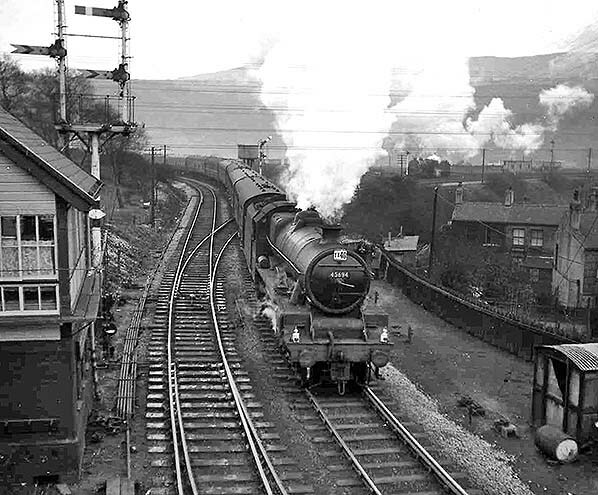 Looking east at Hall Royd Junction on 30 March 1964 as No.45581 ‘Bihar & Orissa’ approaches, hauling a Batley to Blackpool (via Rochdale and Bury) excursion. The loco is a Stanier-designed ‘Jubilee’ class 4-6-0 constructed at the North British Locomotive Company works, Glasgow in October 1934. She would be withdrawn on 31 August 1966 from 25G, Farnley Junction shed, and cut up by Drapers, Neptune Street Goods Yard, Hull in December 1966. Today the importance of strong connectivity between northern towns either side of the Pennines is widely recognised, and the Copy Pit route is a strategic trans-Pennine link whose volume of passenger traffic is increasing significantly. It is fortunate that it was not reduced to single track in the 1960s/70s when so many routes underwent such treatment. At present, however, it is not a strong contender for electrification; the Calder Valley route has higher priority, whilst the Standedge route looks certain to be electrified by the early 2020s. The neighbouring Colne-Skipton route - not earmarked for closure by Beeching, but nevertheless closed in 1970 – will form yet another valuable trans-Pennine line if the campaign led by SELRAP (Skipton and East Lancs Rail Action Partnership) is successful. Many thanks to Barry Steventon, Ian Holt, Ken Geddes, Noel Coates, David Taylor, Chris Littleworth, Barry Hilton, Eddie Bobrowski and Martin Bairstow for help received with this project. 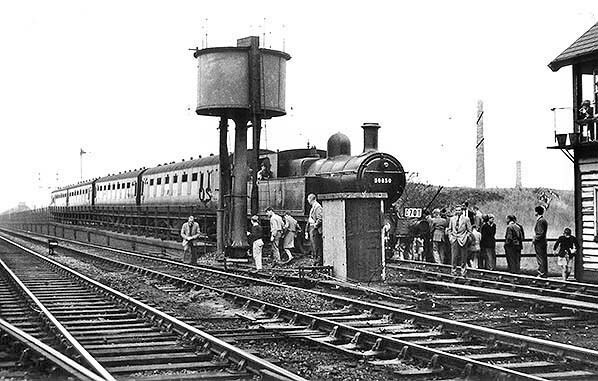 On 17 September 1960 the Roch Valley Railway Society’s ‘Central Lancashire Railtour’ is pausing at Gannow Junction where the Copy Pit route diverges from the Preston – Colne – Skipton line. The locomotive is Aspinall-designed Class LYR5 2-4-2T No.50850. Built in October 1899 at the LYR Horwich works the loco was stored from February 1956 at Bolton shed and was withdrawn from service in 1961 from 7C, Southport shed and cut up at BR Crewe works. This loco was the last of its class to survive. 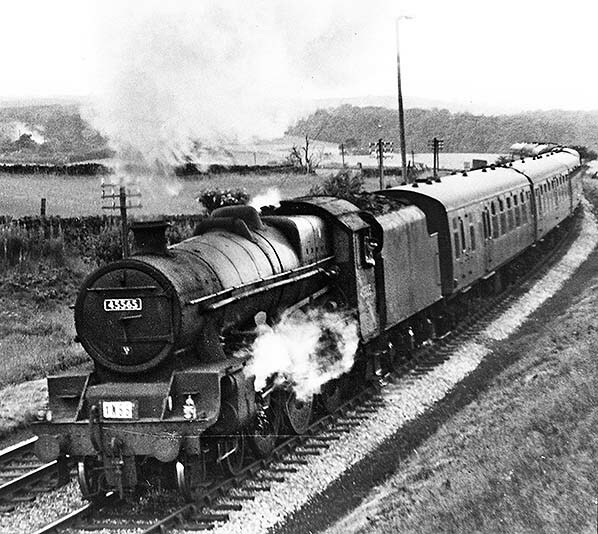 On 17 September 1960 the Roch Valley Railway Society’s ‘Central Lancashire Railtour’’ is seen at Stansfield Hall Junction. The locomotive is Aspinall-designed Class LYR5 2-4-2T No.50850. 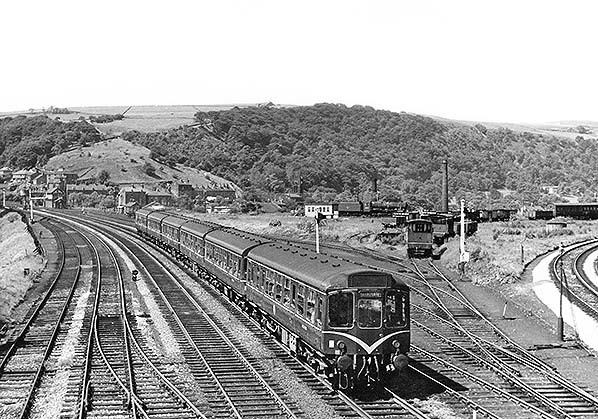 The Roch Valley Railway Society’s ‘Central Lancashire Railtour’ is seen on the Todmorden Curve on 17 September 1960. The WD loco in the siding is a banker. In the background a ‘Crab’ is hauling a Calder Valley westbound freight. 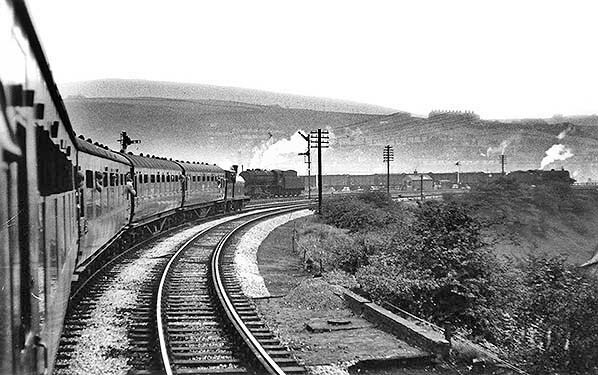 The Roch Valley Railway Society’s ‘Central Lancashire Railtour is seen on the Todmorden Curve on 17 September 1960 approaching Todmorden East Junction. 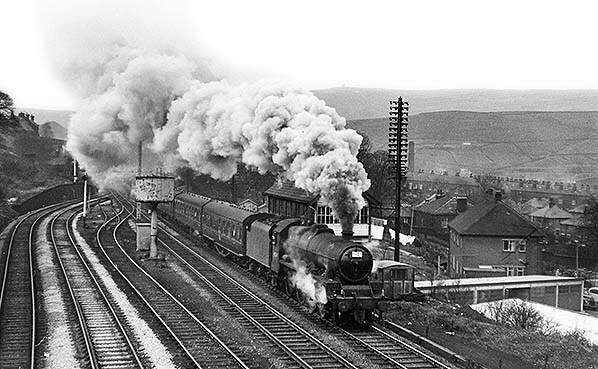 Looking west towards Todmorden at Hall Royd junction on 15 July 1961 as Stanier-designed ‘Black Five’ 4-6-0 approaches heading the 6.30am Liverpool Exchange to York train. The engine was built at the BR Horwich works in November 1950 and would be in service until May 1967. She was withdrawn from 26A, Newton Heath shed, to be disposed of by Cohens, Kettering, Northamptonshire in February 1968. A Stanier ‘Black Five’ No. 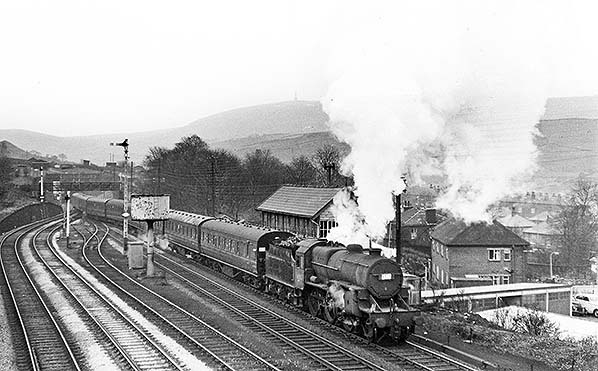 45208 from 25F, Low Moor shed, is seen at Hall Royd Junction on a 1X38 Bradford to Blackpool excursion taking the Rochdale (as opposed to the Copy Pit) route on 29 March 1964; either route could be taken from Bradford to Blackpool. The 4-6-0 loco was built by Armstrong Whitworth at Scotswood, Newcastle upon Tyne, in November 1935 and carried the LMS number 5208; at nationalisation BR added the ‘4’ prefix. She was withdrawn from Low Moor on 21 October 1967 and disposed of the following year either by Campbells (Airdrie) or Wards (Killamarsh, Sheffield). 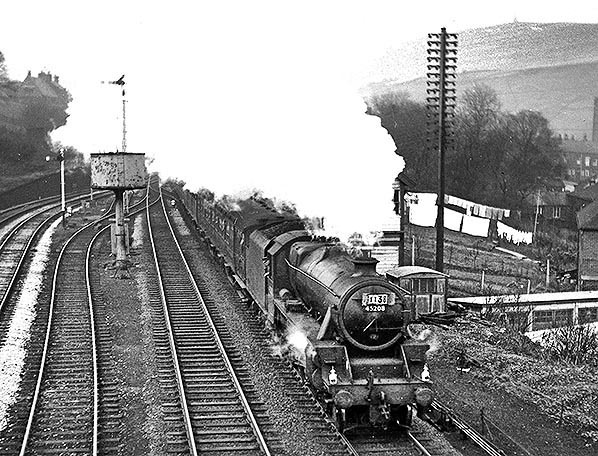 Looking east at Hall Royd Junction on 30 March 1964 as an empty stock train approaches for a Todmorden to Blackpool excursion; note the use of the cross-over. The locomotive is No.42712, a Hughes-designed ‘Crab’ 2-6-0 built at the LMS Horwich works in March 1927. She would be withdrawn from 9B, Stockport shed, on 26 February 1966 and cut up in June 1966 by Cashmores, Great Bridge. The water tower and signal box will be noted. The monument on the horizon stands close to the summit of Stoodley Pike and was erected in 1856 at the end of the Crimean War. It replaced an earlier structure nearby which commemorated the British military victory at Waterloo in 1815 but had collapsed in 1854 after being struck by lightning. Looking east at Hall Royd Junction on 30 March 1964 as No.45565 ‘Victoria’ takes the Copy Pit route and heads a Blackpool excursion formed of LNER stock. The engine is a Stanier-designed ‘Jubilee’ class 4-6-0, built at the North British Locomotive Company works, Glasgow, in August 1934. She would be withdrawn from 25F, Low Moor shed, in January 1967 and cut up five months later by Drapers, Neptune Street Goods Yard, Hull. The 13-arch viaduct between Stansfield Hall and Cornholme stations is known by various names, including Knott Wood (alternative spellings are Knot Wood and Nott Wood), Kitson Wood (the name of the adjacent tunnel) and Lydgate. 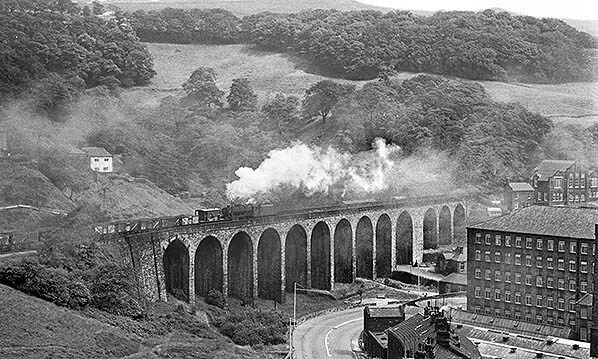 Jostling for space with the A646 road, mills, houses and public buildings in the deep and narrow Calder valley, the viaduct makes a spectacular setting for photographs, such as this one taken on 10 June 1966 of a double steam-headed holiday extra from Bradford to Blackpool; there might also have been a banking locomotive at the rear. Leading is No.44694, a Stanier ‘Black Five’ 4-6-0 built in November 1950 at BR Horwich works. This loco would be withdrawn from 25F, Low Moor shed, on 31 October 1967 and disposed of by T W Ward, Killamarsh, Sheffield in February 1968. No.45565 ‘Victoria’ is a Stanier-designed Jubilee class 4-6-0, built at the North British Locomotive Company works, Glasgow, in August 1934. She would be withdrawn from 25F, Low Moor shed, on 6 January 1967 and cut up five months later by Drapers, Neptune Street Goods Yard, Hull. 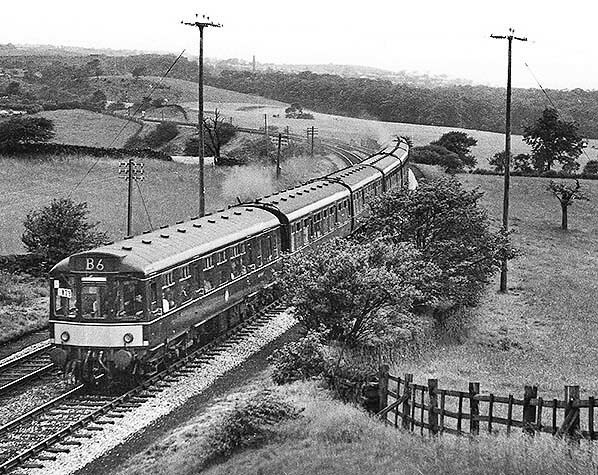 On 16 July 1966 a BRCW (later Class 110) ‘Calder Valley’ 9-car DMU is seen above Towneley on the 13.40 Blackpool South to Bradford working. 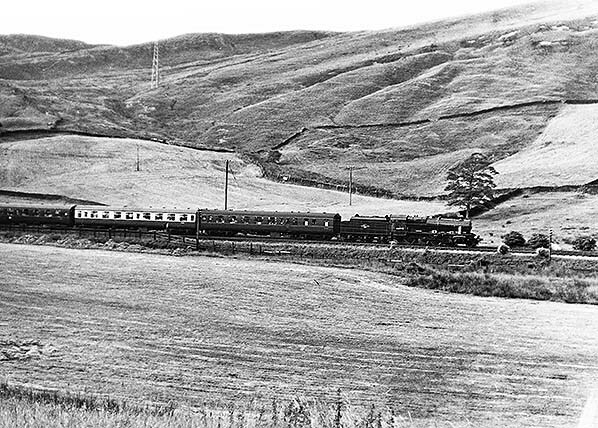 A Blackpool North to Castleford extra is seen above Towneley on 16 July 1966 hauled by Stanier-designed ‘Black Five’ 4-6-0 No.44910. The loco was built at the LMS works at Crewe in November 1945 and was originally numbered 4910. She would be withdrawn from 26A, Newton Heath shed, on 30 June 1968 and disposed of five months later by Drapers, Neptune Street Goods Yard, Hull. On 16 July 1966 No.45565 ‘Victoria’ is seen above Towneley hauling a Blackpool to Bradford (extended to Castleford) train. The engine is a Stanier-designed JUBE class 4-6-0, built at the North British Locomotive Company works, Glasgow, in August 1934. She would be withdrawn from 25F, Low Moor shed, on 6 January 1967 and cut up five months later by Drapers, Neptune Street Goods Yard, Hull. 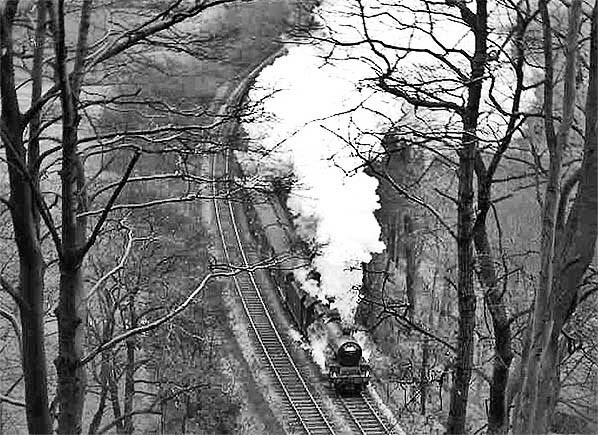 On 20 April 1968 the end of steam on British Rail is only four months ahead as the Manchester RTS/Severn Valley RS ‘North West Tour’ heads westwards on the Copy Pit route; by this time has been closed to regular passenger trains but still handles freight and occasional passenger ‘specials’. The journey started and finished at Birmingham New Street and was timed to pass Hall Royd Junction (Todmorden) at 14.01 and Gannow Junction (Rose Grove) at 14.21. Locos Nos.73134 and 73069 double-head the train over the 13-arch viaduct between Stansfield Hall and Cornholme stations known variously as Knott Wood (alternative spellings are Nott Wood and Knot Wood), Kitson Wood (the name of the adjacent tunnel) and Lydgate. No.73134 (leading) is Class BR5 4-6-0 built at Derby works in September 1956, to be withdrawn from 10C, Patricroft shed, in June 1968 and cut up by Cashmores, Great Bridge in October 1968. No.73069 is of the same class, built at Crewe works in November 1954, to be withdrawn in August 1968 and cut up by Cashmores, Newport in March 1969. 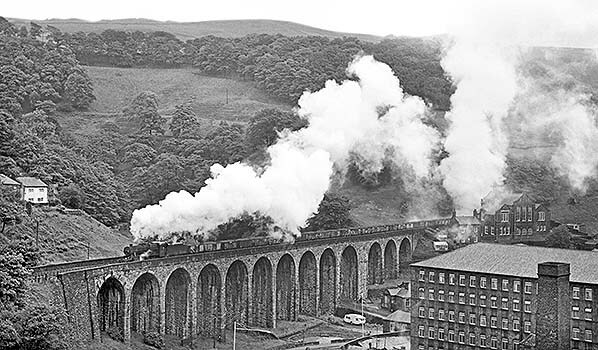 On 16 June 1968 the RCTS ‘Dalesman No.2’ railtour is westbound on the viaduct at Lydgate, between the disused Stansfield Hall and Cornholme stations. 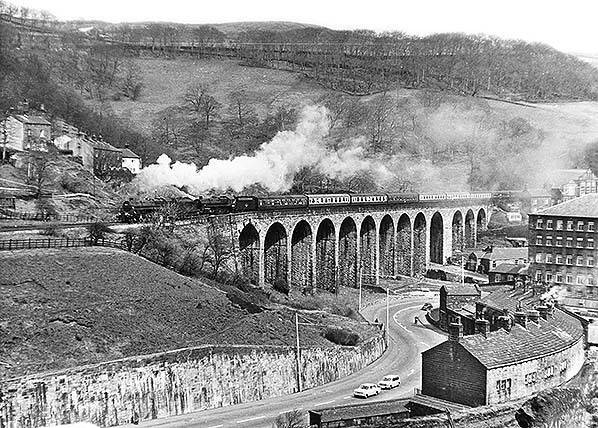 The viaduct has been known by a number of names: Knott Wood (the spellings Knot Wood and Nott Wood have also been seen), Kitson Wood (the name of the tunnel just off the picture to the right) and Lydgate. The tour began in Leeds and is seen here on its journey to Preston; later in the tour the Grassington and Ilkley branches were visited, the latter being in serious danger of closing at that time. ‘Britannia’ class No.70013 ‘Oliver Cromwell’ is hauling nine coaches in an awkward assortment of crimson and rail blue/grey livery. The 4-6-2 loco was built at BR’s Crewe works in May 1951 and was withdrawn from 11A, Carnforth shed, on 17 August 1968; she is now part of the National Railway Museum collection. 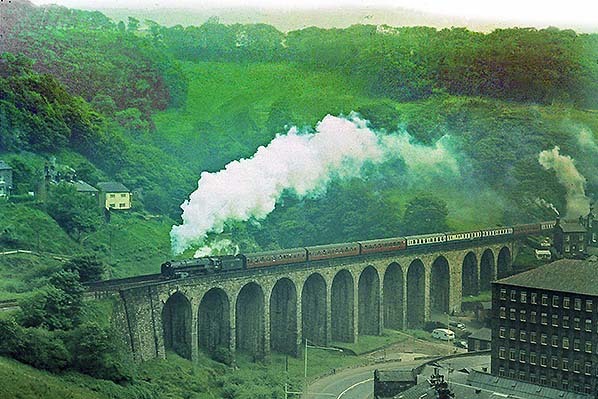 On 23 June 1968 the 4.00am coal train from Mirfield to Padiham Power Station has emerged from Kitson Wood Tunnel and is crossing the viaduct at Lydgate, between Stansfield Hall and Cornholme. 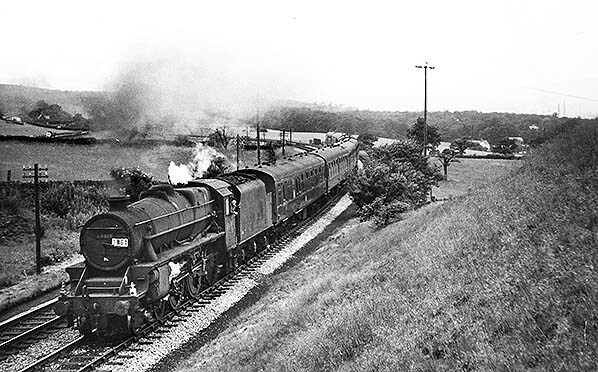 This evocative photograph captures the last days of steam; in only six weeks’ time, on 11 August, the ‘end of steam’ would be marked by the running of the ‘Fifteen Guinea Special’ from Liverpool via Manchester to Carlisle hauled by two Carnforth-based locos, and steam haulage on British Rail was to be banned from the following day. The loco seen here is Stanier Class 8F 2-8-0 No.48519 built for the War Department (WD) at Doncaster works. Its date of construction, shed allocation and its withdrawal and disposal details have not been found. 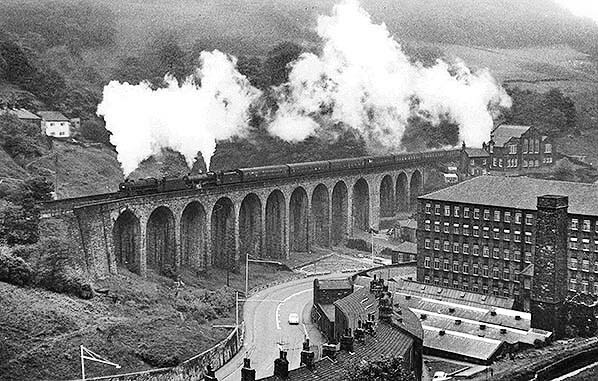 The rear of the 4.00am coal train from Mirfield to Padiham Power Station is seen on 23 June 1968 as it crosses the viaduct at Lydgate between Stansfield Hall and Cornholme. Freight trains on this steeply-graded route often had banking assistance, as is seen here on the rising 1 in 65 section. The loco is Stanier 8F 2-8-0 No.48423 built for the War Department at Swindon Works. Its date of construction, shed allocation and its withdrawal and disposal details have not been found. The head of the train is seen on the preceding photo.